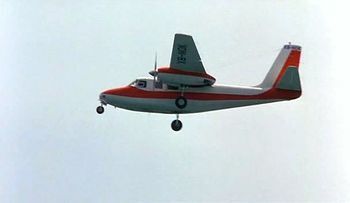 Aero Commander 500 seen in Arachnid. The Aero Commander 500 is the first in a series of light twin piston-engined aircraft originally built by the Aero Design and Engineering Company in the late 1940s. In 1950 it became the Aero Commander company, and a division of Rockwell International from 1965. The initial production version was the Aero Commander 520. Versions manufactured after 1967 are known as the Strike Commander. This page lists all films that feature a variation of the Aero Commander 500. Pages in category "Aero Commander 500 family"
This page was last modified on 26 November 2017, at 15:44.